If you weren't completely turned off to the Terminator franchise after the cinematic sewage that was Terminator 3: Rise of the Machines, the latest issue of GamePro might be of interest to you. The mag reveals the first concrete details on Terminator Salvation, the video game adaptation of the movie directed by McG and starring a mentally unhinged Christian Bale. Developed by Bionic Commando devs GRIN, Terminator Salvation apparently has an "epic story," "numerous menacing Terminator machines" and "weapons," according to GamePro's preview. Halcyon Games announced its intentions to bring the GRIN-developed Terminator Salvation – The Videogame to the Xbox 360, PlayStation 3, Wii, and PC in November, promising "a visceral story with extremely polished production values to create a fully interactive Terminator experience." 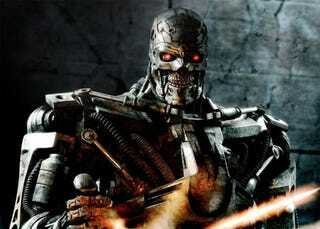 It also has a very scary look at the T-600, the massive Terminator new to the apocalyptic sci-fi franchise. It's huge! And its eyes glow! Warning: GamePro says the issue is "about to blow your face off like the enormous Earth-incinerating blast depicted in Terminator 2: Judgment Day." Read carefully and with a spare face.